‘Tis time for some tennis and not just any tennis. This is Wimbledon, the oldest and most prestigious of tournaments in the tennis world today. With that history, comes tradition and many of those traditions have stayed in place for the past 137 years. The favorite among that tradition is strawberries and cream. It is said, that fans from all over will consume over 23 tons of strawberries and 7000 liters of cream during this event! Or for all of you non-metric people thats 46,000 pounds of strawberries and over 1800 gallons of cream. Over 9,000 servings are prepared per day at Wimbledon! Unfortunately, not everyone can jet across the pond to watch this amazing event in person, and eat all those strawberries and cream. So many of us American tennis fans, have our own tradition of watching our morning Wimbledon matches over breakfast. As much as I love tradition, I’m always putting a spin on recipes, so join me for my take on Breakfast at Wimbledon, in Shonal’s Kitchen! 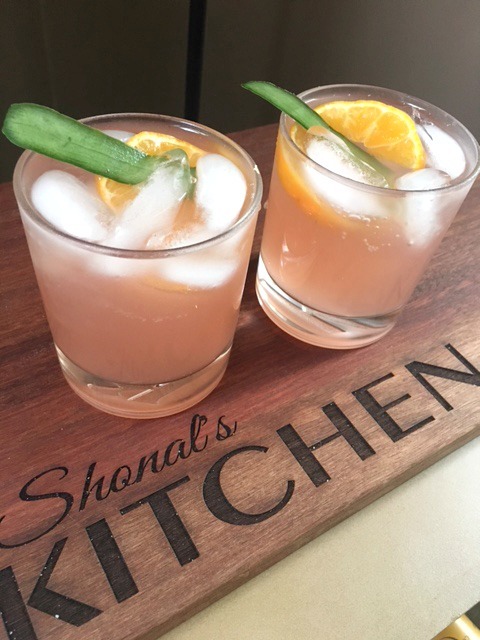 By now, you know I enjoy a good cocktail, so while some may be having high tea with breakfast, I’m going with a brunch type cocktail! The Kentucky Derby has the Mint Julep, The Preakness has the Black Eyed Susan and Wimbledon has the Pimm’s Cup. This widely known British potion is slightly spicy and refreshingly tangy, and the perfect summer drink. Over 80,000 pints of Pimm’s and lemonade are sold to spectators every year. I just happen to be sipping on one as I write this for you! Add ice to chilled glass, stir in Pimm’s and ginger beer and garnish. Traditionally, lemonade or lemon lime soda is used, but some are using ginger beer, which I liked because it gave it a spicy and even more refreshing touch to it. Cheers! I’m always a fan of smoked salmon, so when I saw they served it at Wimbledon, I was all over it! There were a lot of tea sandwiches happening with the salmon, but I decided to go in a different, but still traditional direction. I’m in love with these pistachio almond crackers, made by Nonni’s Thin Addictive’s. They’re a combination of sweet and savory and are a perfect pairing for a cheese platter. 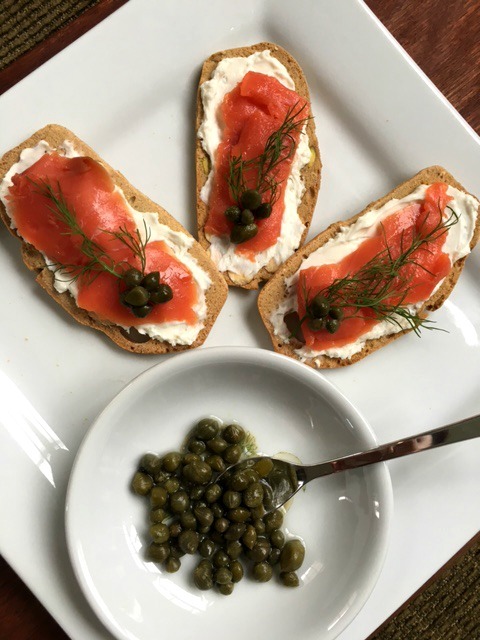 Think smoky salmon, salty capers, luscious creamy cheese and a touch of dill, all in one delicious bite. Amazing. Spread whipped cream cheese on crackers, then place a slice of smoked salmon on top. Garnish with a sprig of fresh dill and a couple capers. Serve with a small bowl and serving spoon, of capers. We can’t have a proper Breakfast at Wimbledon without some kind of tea sandwich, right? I kept it real on this one and made a traditional tea sandwich with cucumbers and radishes, and to my surprise, they were pretty tasty. But then again, how do you go wrong with cream cheese and butter? Hey, I didn’t say they were low calorie. They sure were pretty though and my daughter and I had fun making them (she had fun eating the butter)! In a small bowl, combine chopped dill with whipped cream cheese, then spread ½ tablespoon of mixture on 4 slices of the bread. Spread ½ tablespoon softened butter on the other 4 slices of bread. Lay cucumber slices down on bread with cream cheese mixture, then lay buttered slices down over cucumber (so butter is on inside). Using a sharp knife, cut crusts off all 4 sides, then cut diagonally into 4 triangles. 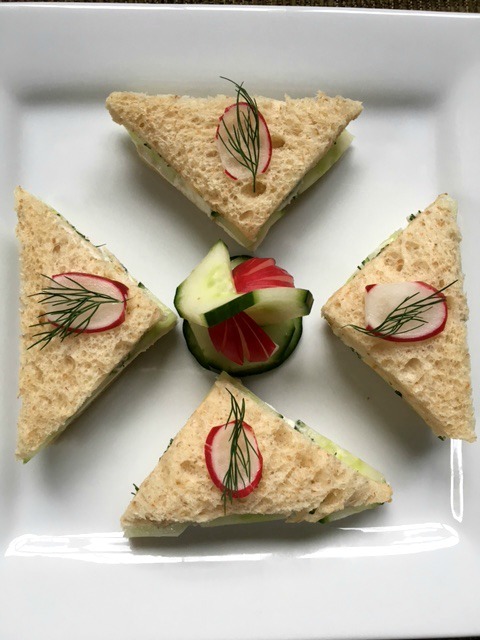 Place sandwiches on platter, place thin slices of radish on each sandwich and overlay a small sprig of dill on the radish. Garnish plate with extra decorative radishes and cucumber. Makes 16 small tea sandwiches. I saved the best for last. You can’t do Wimbledon without the legendary strawberries and cream! 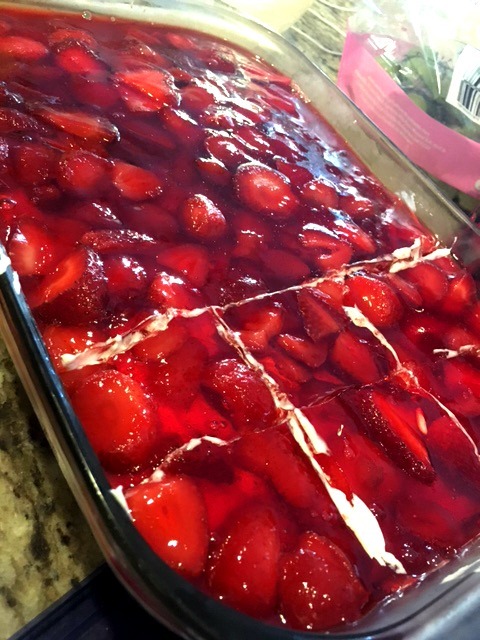 I was going to go the traditional route with fresh strawberries and homemade whipped cream, until we had dinner at a friend’s house and she served this “Strawberry and Pretzel Salad”….I was thinking it would be somewhere along the lines of a spinach salad with strawberries and maybe a pretzel crunch? But nooooo….my life changed the minute it hit my taste buds. Sweet and salty, crunchy and creamy, tart and tangy…seriously all of that in one amazing bite! Where we live, it’s a southern staple and on many a holiday table, but is so refreshing, it can be served year round. It’s definitely a must try! Mix together and press into a 9X13 baking dish. Bake at 400 degrees for 10 minutes. Let cool. Combine cream cheese and sugar, then fold in cool whip. Spread over cooled pretzel crust. Mix together strawberry jello with boiling water. Stir in strawberries, then let sit till it is the consistency of egg whites. Then spread on whipped topping and place in fridge to set. Well, my tennis loving foodies, it’s been fun. The finals are upon us…will Serena win her 9th Wimbledon? Pour yourselves a Pimm’s Cup (or 2), grab a cucumber tea sandwich and let’s watch and see!